Welcome to day 3 of September Sewing Celebration! Remember to add your project photos here and link to them here, as many of you vowed to raid your stash to create your own Very Biased Skirt, late into the night after those whom you love most are sleeping. Jordan, aka Jord, aka Jo, aka Mama Gooch, aka Mrs. Dr. Gooch, aka Mrs. Mango. The writer and philosopher, although she is capable of many other noble endeavors as well. but today she is here. When Katy asked me to contribute a post for sewing month here at No Big Dill, I hesitated heavily. Not because I don't believe in the cause of the seamstress or don't marvel at the power one can wield with a Bernina, it's just that I don't sew. I have sewed things, but I don't sew. And this is not to say that I won't or can't. Katy and I came to the conclusion that if we were both given a completely free evening to do with whatever we pleased, she would cozy up to her machine, ginghers and straight pins nearby while I would cozy up on the couch with Leo's Anna Karenina. Neither of us could understand the other's choice, really, but I understood that for her, sewing is perfection and she understood that for me it is words. And, she knows, I never run out of words. If only, with words, I could conjure a closet full of beautiful dresses. So, for you, a story, about a dress that was sewn. 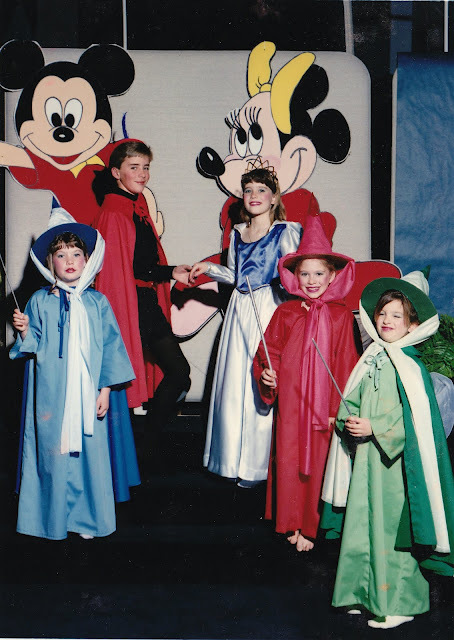 I was in 4th grade when I played the part of Sleeping Beauty in the Disney Spectacular at my elementary school in New Mexico. I was thrilled about everything about it. The lipstick and eyeshadow, the spotlight, the music, my three fairy godmothers and, of course, the dress. I was thrilled about everything except dancing with Roger. Roger was Prince Phillip and he was in the 5th grade. This was absolutely mortifying for a 4th grader. 5th graders, to 4th graders, dwell in a whole other dimension. We had to dance and I still remember someone offstage constantly telling me to smile. I was painfully shy and Roger was handsome. How could they possibly expect me to smile? But smile I did and then I even let him "hold" my hand. But this is not about Roger. This is not about Roger at all. This is all about the dress. This is about the dress and my mother who made it. And any mother who cuts and fits fabric and finishes it with flounce and trim and even a little shine. Any mother who pulls together meals held up by table cloths and tealights. Any mother who sends her children out into the world with minds sparkling with confidence in themselves. This is about creating perfection in a very imperfect world. He figured that way we could all just do what we want. I began describing to him the chaos that would ensue if we all just “did what we want”, but I had been posing the same question to myself. That night, as I climbed into bed to send myself off to sleep, I watched as Dr. Gooch got dressed for work. As I slipped into the covers he slipped out the door into the long dark night. Exhaustion would eventually overcome him about the time I hit dreamland and upon waking in the morning I would begin to worry that he might fall asleep on his commute home. I would wait for his call. And almost immediately upon entering the kitchen where we would be mid-morning rushing to get off to school, his day would end. Right there, on the kitchen floor. I could almost see it in his face, his turning off. Then on with the day. On with my day without him. How could this be fair, to have whole nights and whole days without him as a part of our normal routine? Why does it have to be this difficult, why must we float in different time zones like this, never quite crossing both the same awakeness at the same time. Why can't we just do what we want? Why can't everything just be perfect? We have to fight tooth and nail for perfection always remembering that we'll never reach it because then we would stop reaching. It’s the only way to be. And it's the only way to be together. To be ye perfect. To me the dress was perfect. In this memory, the dress stands out as the sharp focused point in a photograph where all else has been blurred. That must have been why I kept it all these years. Then, one day, my Lucy discovered the dress hanging in the back of my closet between Dr. Gooch's graduation gown and her baby blessing dress. I told her the story of the dress and how my mother made it for me. Of course, she pleaded with me to let her wear it. Of course I agreed. But, a dress made for a 4th grader was hard for a preschooler to dance and dream in. So, the tearing was inevitable. I would caution her to "be careful", the more you wear it, the more it will tear. But, she kept it on, sometimes wearing it to bed, showing this dress favor over all the other store bought frocks. If you've read on this far, I'll continue my story. A story of another dress. My wedding dress, made by my sister. You know which one. It was beautiful and simple and fit like a glove. 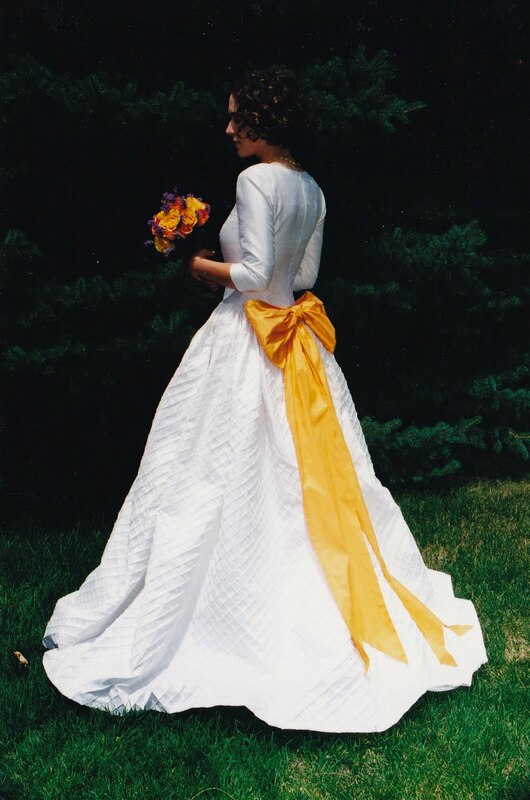 Quilted silk, v-neck, three-quarter sleeves, a slight drop waist, and a gorgeous yellow, raw silk bow that trailed down the back of the skirt. It was perfect. And stolen somewhere in transit via the USPS from Provo to our first home in New Orleans. Then, it isn't about the dress, right? But that it was made perfectly for us. Because in this imperfect world, in which we will never be able to do what we really want, We can create for each other, that perfect dress that makes us smile and dream and reach. A year after Lucy's discovery, she is still wearing the dress, even though it is quite immodest. But, I don't sew, if I did, it would have certainly been mended by now. Katy promised me she'd make me another wedding dress someday. And, maybe, when she comes to visit with her five baby dills, she'll make some time for a bit of mending. That is the most beautiful wedding gown!!! Oh My Goodness. Perfection! 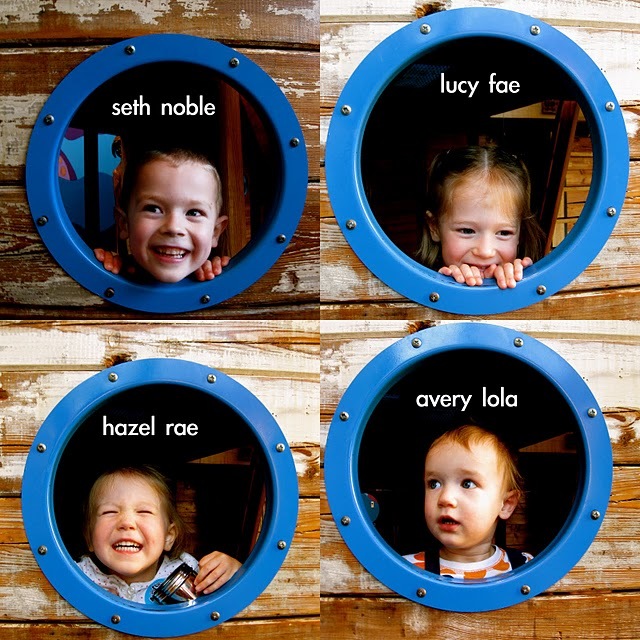 If I can but send my little ones into the world with the joyful way you Knudsens have about you. Thank you for the lovely essay. Oh my goodness that wedding dress is perfection. That is the most beautiful, modest well fitting wedding dress ever! it really is stunning! Your sister is Amelia Erhart?!!! Thank you for sharing your view on perfect. I think it was perfect. And Katy's right, you should write a book... that would be perfect! Since you are supposed to be the sewing sister and you are still marvelous at stringing words like pearls, i would venture to guess that Jordan could be quite the seamstress if she wished. and Of course, you are both quite accomplished in the realm of making beautiful babies and gracing them with beautiful names. What a stunning dress and a beautiful story. I am sure many moms wonder if their sewing for their little girls and boys will make an impression long term and I am sure your mother is beaming to see the next generation wearing the dress she worked so hard to construct. As for the wedding dress it is stunning. The creativity to think of quilting silk and the skill to make the bodice and sleeves fit so perfectly - both amazing. I have fond memories of that dress as a little girl as well. I wish I could write instead of sew!